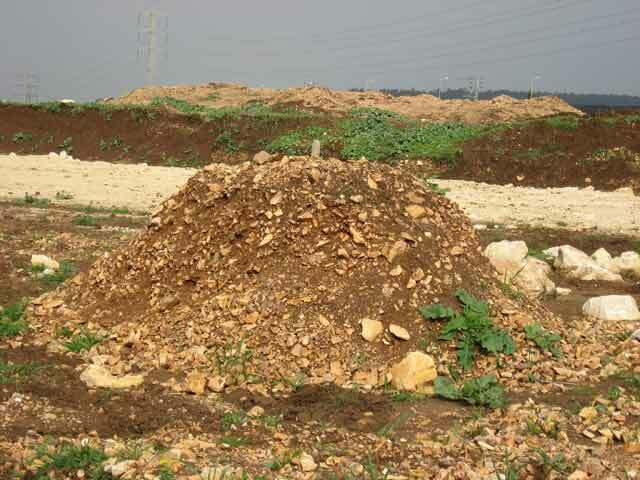 During February–March 2008, a trial excavation was conducted east of Giv‘at Rabbi (Permit No. A- 5367; map ref. 226143–995/736634–7231), in the wake of development work preceding the construction of an industrial zone for Nazareth. 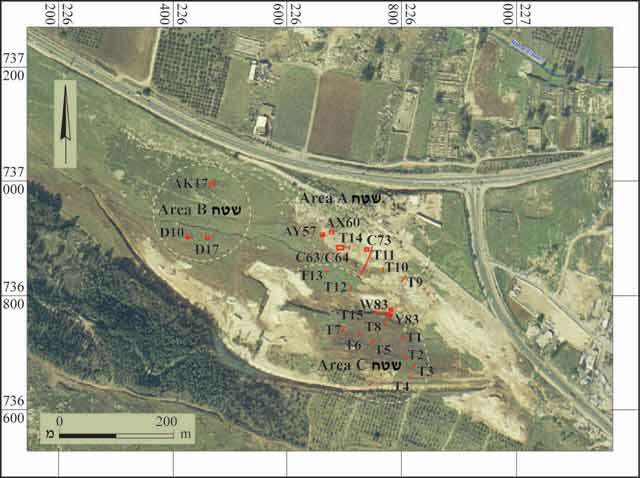 The excavation, on behalf of the Israel Antiquities Authority, was directed by O. Barzilai and I. Milevski (field photography), with the assistance of O. Marder (area supervision), Y. Ya‘aqobi (administration), R. Mishayev and T. Meltsen (surveying and drafting), A. Shapiro (GPS), M. Inbar (geomorphology), C. Amit (studio photography) and L. Zeiger (flint drawing). Probe trenches had been dug at the site in the past (Z. Daniel). 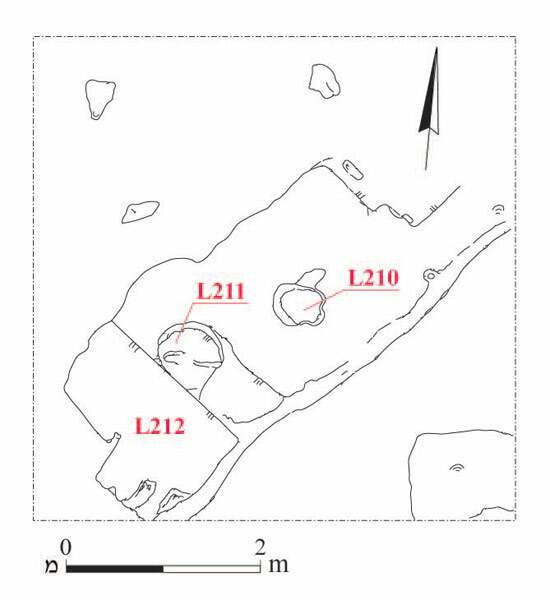 The site extends across an area of c. 200 dunams, on either side of a tributary of Nahal Zippori.Three excavation areas (A–C; Fig. 1) were opened; nine squares were excavated and fifteen probe trenches were dug with the aid of a backhoe. A knapping site from the Middle Palaeolithic period (Mousterian culture) that yielded an enormous amount of flint artifacts was exposed in the southern part of the site (Area C); a knapping area dating to the Pre-Pottery Neolithic B period was exposed in the center of the site (Area A); and a wall and rock-cuttings from the Roman period were uncovered in the western part of the site (Area B). Many flint tools from the Neolithic period and remains of field walls were discovered in the probe trenches that had previously been opened at the site.A survey in the surrounding area (HA-ESI 121) recorded numerous scatters of flint artifacts and documented three sites: one from the Pre-Pottery Neolithic period (Area A in the current excavation), the second from the Pre-Pottery Neolithic and Pottery Neolithic periods and the third from the Middle Palaeolithic period (Area C in the current excavation). The Middle Palaeolithic Period(Mousterian Culture; Area C). Dozens of tons of flint implements were discovered in Squares Y/W83 and in Trenches 1 and 8. A layer (thickness c. 1 m; Fig. 2) composed of flint chunks mixed with light colored clay soil was exposed in Square Y83. 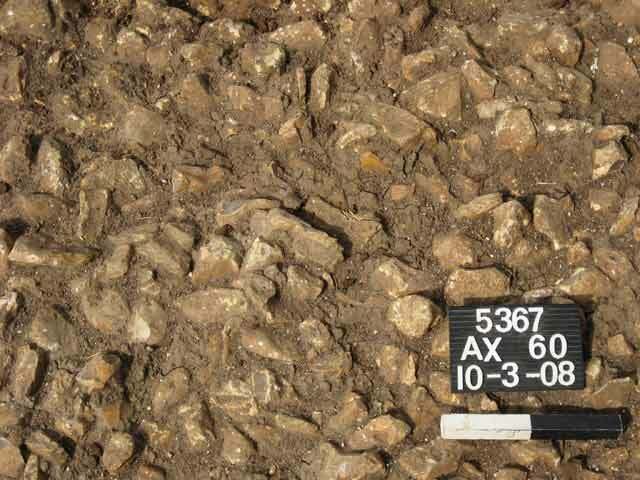 This layer, which was located partly on qirton bedrock, contained natural flint nodules that were used in knapping flint tools. The layer was formed as a result of the knapping activity, as well as the deposition of clay soil from flooding that occurred over the years. Above this layer was a thick layer of dark clay soil (thickness c. 2 m) that contained a very meager amount of flint artifacts and worn potsherds. Large quantities of flint artifacts (Figs. 3, 4) were discerned in the piles of soil created during the course of development work; hence it seems that a significant part of the site was damaged. 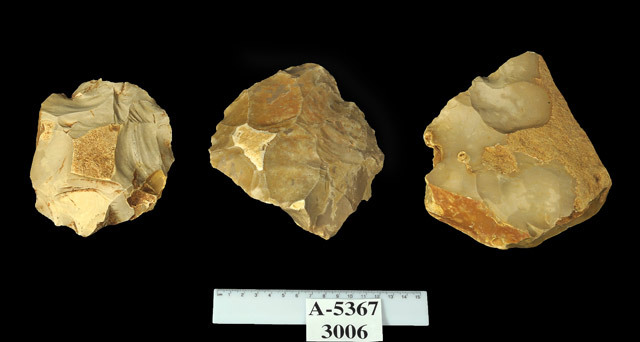 The flint artifacts recovered from Area C are dated to the Mousterian culture (250,000–50,000 YBP) and include cores (Figs. 5, 6:3, 4), flakes and points (Fig. 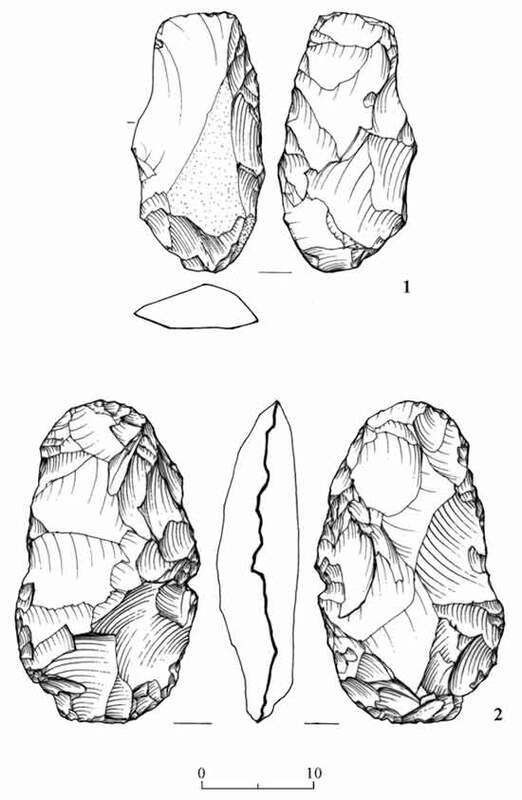 6:1, 2) that were knapped using the Levallois technique. A geomorphologic examination revealed that the Mousterian site is situated inside an ancient drainage basin (birqa) that was found in situ. This basin was apparently formed as a result of a geologic fault, c. 300 m to the west of the site. Discoveries of lumps of natural flint, primary cores and flint debitage show that this knapping site is located atop sources of raw material. The enormous amount of artifacts and the diversity of types points to the discovery of an extensive site (min. 10 dunams), which served as a source of raw material for a long time, probably for tens of thousands of years.In a broader context, the site contributes to reconstructing the pattern of life in the Middle Palaeolithic period. Human society during this period was composed of small groups of hunters-gatherers who lived in caves, such as the Qafzeh Cave, located c. 7 km south of the site. Undoubtedly, the knapping site at Giv‘at Rabbi (East) constitutes a station in the seasonal nomadic cycle of these groups in the Lower Galilee. Pre-Pottery Neolithic B (Area A). 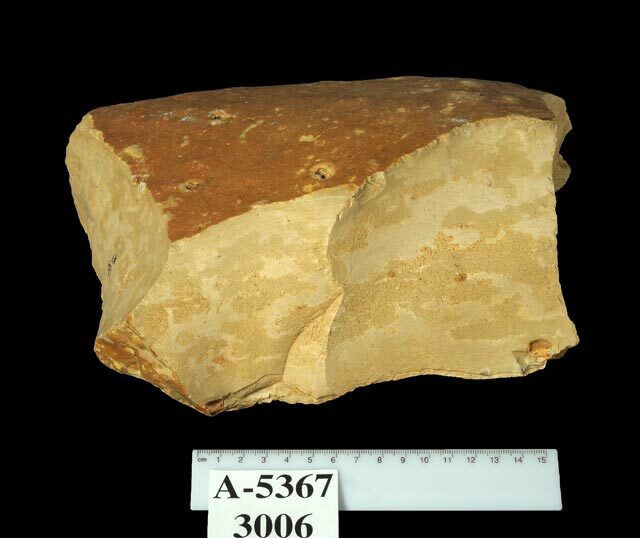 Several squares (AY57, AX60, C63/64, C73) were excavated; a layer of flint stones right on top of bedrock, which was covered with dark clayey soil (thickness 0.2–1.0 m), was exposed in all of them (Fig. 7). Knapped flint items, mostly flakes, were discovered in all the squares. A level containing knapped products that consisted of blades (Fig. 8) and axes (Fig. 9), which are characteristic of the Pre-Pottery Neolithic B period, was exposed in Square AY57. The geomorphologic examination indicated that this region is located outside the ancient drainage basin and was apparently part of an exposed slope. It seems that the knapping site in this area was an industrial zone; it formed part of a large settlement in the Pre-Pottery Neolithic B period, whose remains extend as far west as ‘En Zippori (HA-ESI 122).It seems that the craftsmen active at Giv‘at Rabbi in the Pre-Pottery Neolithic B period specialized in knapping flint blades and axes; in this respect, the excavation findings are similar to those of Yiftah’el, Ha-Movil Junction (Garfinkel Y. 2007. The Pre-Pottery Neolithic B Naviform Industry of Yiftahel. In L. Astruc, D. Binder and F. Briois (eds). Technical Systems and Near Eastern PPN Communities [Editions APDCA; Neo-lithics 2/08:3–11]. Antibes. Pp. 203–213) and Kefar Ha-Horesh (SENEPSE 1 :427–443). 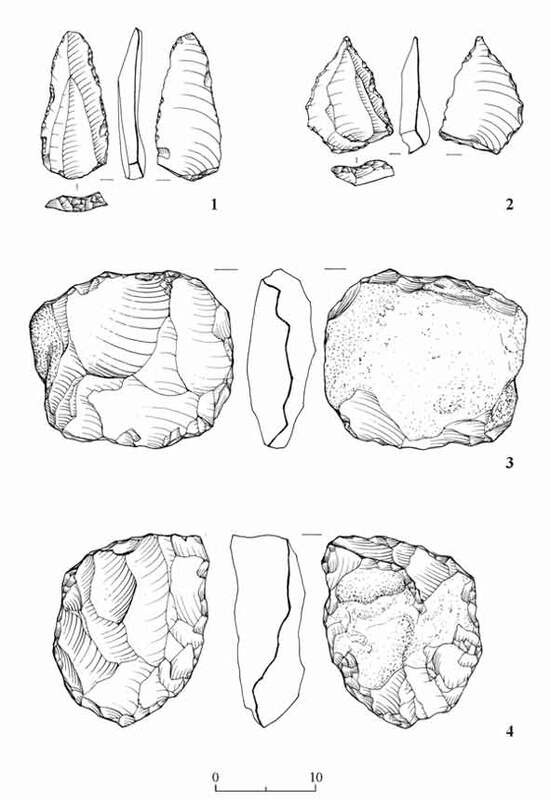 Like the Mousterian site in Area C, the knapping site in Area A was located on sources of raw material; yet, unlike the Middle Palaeolithic period (Area C), the knapping was done more intensively and over a short period of time. The Roman Period (Area B). Remains of a massive wall (exposed length 18.5 m, width 2.5 m) that was built perpendicular to the stream tributary were exposed in Squares D10 and D17. This was apparently a farming terrace wall. Two round basins (L210, L211) and a treading floor (L212) south of them, hewn in a bedrock outcrop, were exposed in Square AK17 (Fig. 10). These rock-cuttings seem to have been a winepress; however, as they were not fully excavated, they could also be a stone quarry. Based on the potsherds recovered from the excavation, it seems that the wall and rock-cuttings date to the Early Roman period (first century BCE–first century CE). The nature of the site apparently changed during this period, when the area was cultivated and the site was probably part of the agricultural periphery of the settlement at Zippori. 2. Area C, Section C, looking south. 3. Area C, heaps of soil containing flint items. 4. Area C, lump of natural flint. 5. Area C, primary Levallois cores. 6. Area C, cores and points produced in the Levallois technique. 7. Area A, Square AX60, layer of flint stones. 8. Area A, Square AY57, bipolar ridged blades and a blade core. 9. 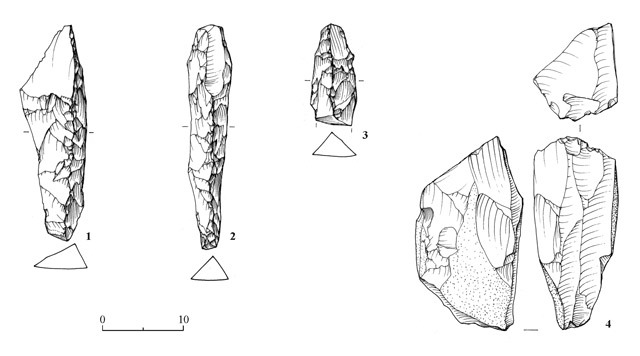 Area A, flint axes. 10. Area B, Square AK17, rock-cuttings in the bedrock, plan.